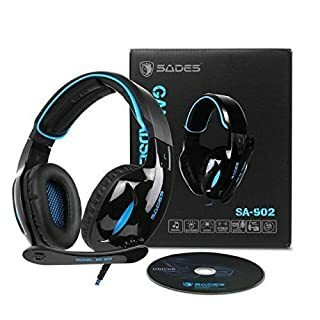 SADES ,with over 20 years of professional production experience and strong technical force,is outstanding in the circel of gaming peripherals ,devoting whole life to provide highest standard and professional gaming accessories. 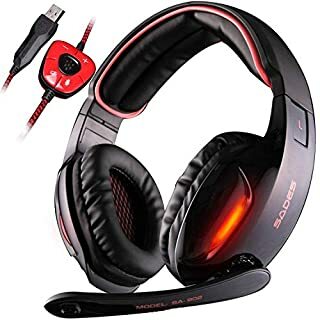 FEATURE: Sades SA902 Surround Sound Gaming Headset Take your gaming experience to the next level. Immersive 7.1 Surround Sound Hear them before they see you with an immersive 360-degree soundfield, featured on the Sades SA902 Surround Sound Headset. Noise cancelling, folding microphone The folding, noise-cancelling microphone reduces distracting background noise and can be stowed and muted in an upright position. Sturdy, Comfortable Design The Sades SA902 comes equipped with exceptionally strong cords and joints for long-lasting durability. Flexible Swivel Earcups Adjustable for a personalized fit that sits flush on your ears. SPECIFICATIONS: 1.Loudhailer diameter: 40mm(NdFeB) 2.Sound effect: 7.1 simulated sound channels 3.Frequency range: 20~20.000Hz 4.Sensitivity: 112dB +/- 3 dB at 1 khz 5.Impedance: 32 Ohm +/- 15% 6.Max Input power: 30mW 7.Mic Dimension: 6.0*5.0mm 8.Mic Frequency Range: 50-10KHz 9.Mic Sensitivity: -38dB +/- 3 dB 10.Cable length: 2.2m 11.Input Plug: USB PACKAGE CONTENT: 1x SADES SA-902 7.1 Surround Stereo Headset With Microphone 1x SADES CD driver NOTE: Compatible with WINDOWS 10 , Drivers Ready to Download Compatible with Windows XP, Vista, 7, 8, 8.1,10 MAC Generic Use (No Drivers) Remind to adjust audio output of your PC/Mac to Headset/Headphones/Other Modes. 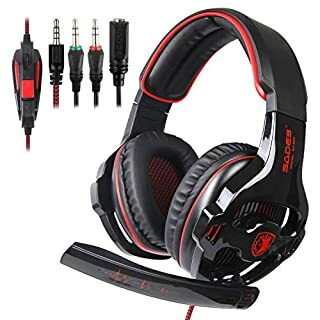 Why Choose SADES SA903 7.1 Channel Surround Stereo Gaming Headset？Amazing 7.1 soundThis headset,With 3d-7.1virtual Clamping Speaker Technology, makes audio output is more stable, more accurate and clearer, let you experience a Virtual Surround Sound Effect.High Performance High Quality 40 mm drivers with neodymium magnets and membranes , provides a premium sound for gaming, music and voice chat with perfectly balanced bass and treble.Feature:1.Input Plug:USB2.Cable length:2.2m 3.Max Input power:30mW4.Mic Dimension:6.0*5.0mm5.Impedance:32 Ohm +/- 15% 6.Mic Sensitivity:-38dB +/- 3 dB7.Frequency range: :20~20.000Hz8.Mic Frequency Range:50-10KHz 9.Sensitivity:112dB +/- 3 dB at 1 khz 10.Loudhailer diameter:40mm(NdFeB) 11.Sound effect: 7.1 simulated sound channels 12. 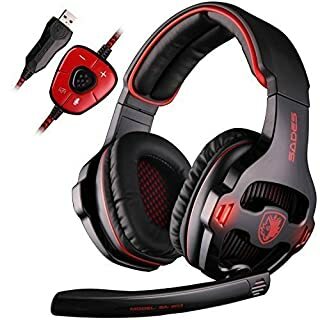 Mic Impedance:smaller than 2.2K ohm at 1khz Package : 1x Sades SA903 Headset(Black and Red)1 x CD driver for 7.1 sound1 x User ManualFriendly Tips1.SADES SA903 USB gaming headset can be used only for PC as a general headset without the driver2.the driver only support the Windows system not support other system3.this gaming headset with no Vibration4. It will be highly appreciated if you could contact E-Happy service team before you left a negative feedback . 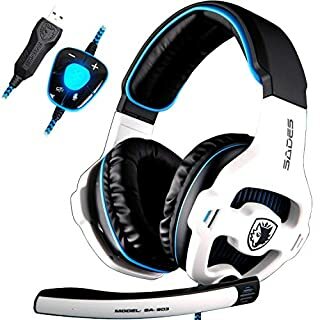 Why you choose SADES?SADES SA810 Headset is a primary kind of gaming headset for PlayStation4,Xbox one PC,Laptop Mac and Nintendo.【Environmental material】The Earmuffs used with the new generation skin-friendly material,reduce heat sweat,more suitable for long-time wear.especially perfect for gamer!【Global Brand】;PC Online Ceremony 'Best Design Award',WCG only authorize gaming headset,Choices of;4 million loyal customers from more than 20 counties【Easy installation】;Plug and play&easy volume control【High compatibility】;3.5mm jack plug cable is suitable for mufti-platform gaming also Work with 32-bit-64-bit Win7/Win8//Win10.Specification1.Headset Weight 365g2.Loudhailer diameter:50mm(NdFeB)3.Frequency range::20-20.000Hz4.Max Input power:20mW(max)5.Plug:3.5mm6.Mic Sensitivity:-32dB+/-3 dB7.Cable length:2mNotes:1.Extra Microsoft adapter(Not Included)is needed when connect with old version Xbox One controller.2.1-to-2 3.5mm jack splitter cable(Included)is needed when you connect with PC if you want to use headset and microphone at the same time.Package Includes:1 x SADES gaming headset1 x 3.5mm jack plug cable1 x 1-to-2 3.5mm jack splitter cable1 x Headset InstructionRecommendation:【PS4 Headset】;Tips for setting:1.Insert the headset's plug into gamepad.2.long pressing PS4 button and enter System Settings.3.Choose"PERIPHERAL MACHINES","ADJUST SOUND AND DEVICES","Output to the headphones","All audio".【Xbox One Headset】;You can directly use this headset if your xbox one controller has 3.5mm audio interface.Otherwise,you need a Microsoft adapter(NOT included)and connect the headset to the adapter.【PC Headset】;Please use the 1-to-2 3.5mm jack splitter cable(Include)If your desktop has separate audio and mic input. 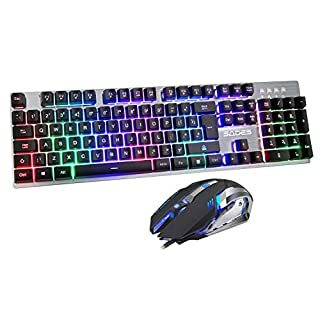 SADES EK-1 Wired Keyboard and Mouse (Usb 2.0) : Comfortable Design： The SADES EK-1 is designed for ergonomics and it's comfortable to type or play games. Its aluminum based body and metal back panel design give it a modern look with elegance. With a sleek low-profile build, it won't take up extra space at your desk or work station; It can be moved around freely without having to worry about your keyboard getting in the way! Built-in swivel feet allow for adjustable height settings so your wrists and hands will remain comfortable posture Finer-resolution mouse Precision control with 4 DPI settings: 800 / 1200 / 2400 / 3200, with DPI switch flashing indicator function Ergonomic design, 6 buttons and ultra-precise Scroll Wheel for superior productivity and efficiency. Fits your hand naturally ,long-term use without fatigue. Backlit LED Keys: Combined with its sleek appearance the EK-1 Keyboard also features LED backlights that cycle between different colors. Function Keys The EK-1 Keyboard offers your computer to run with 12 easy-to-reach multimedia shortcut keys. It offers you the option to play music, turn it off,quickly and easily. Adjust the volume, media control or access your email with ease. The keyboard comes programmed with smart functions that allow you to lock the whole keyboard. Braided USB Cable(Work with USB 2.0 Port) A 59 inch nylon braided USB cable provides strength and reliability. When you take the EK-1 Keyboard out of the box,it's just ready to go ,the Plug and Play Design means it needs no driver installation. 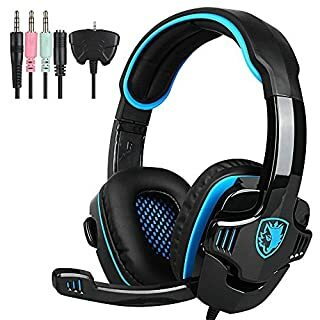 Just plug it in and start dominating your games or works! Wide Compatibility(USB 2.0):Works perfectly with Windows XP/Vista/Win7/Win8/Win10, MAC, Linux or other operating system. Note:If the product has any use problems, please feel free to contact us and we will serve you wholeheartedly. 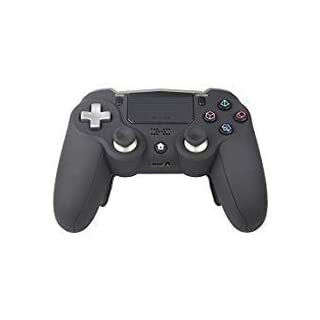 The Wireless Controller features familiar controls, and incorporates several innovative features to usher in a new era of interactive experiences. Give you a better grip while playing and to protect your hand. Improve the looks of your controller and enhance gaming perf hands. Improve the looks of your controller and enhance gaming perf hands, it's the most ergonomic. If the product has any use problems, please feel free to contact us and we will serve you wholeheartedly. 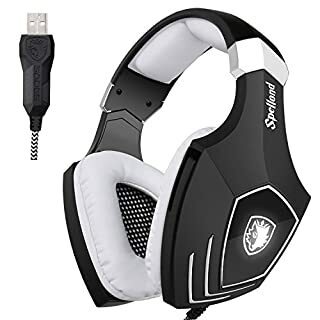 A stylish looking-lightweight, Comfortable big earmuff made with latest comfortable protein leather covers your entire ear and cuts out external sound very effectively. 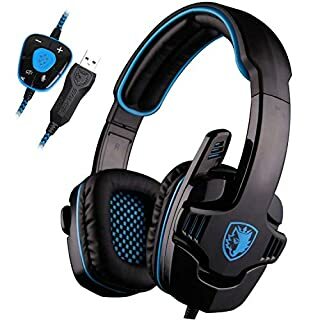 provide a Excellent Games Experience for long wear.Versatile with high performance- you can use it for game, music and movie, featuring Powerful 40mm neodymium drivers for clear audio quality.Easy to use-Easily connected to your computer via 3.5mm audio connectors.Both the gaming/chatting volume can be controlled from the in-line control box. 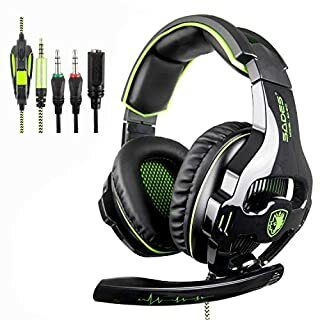 Versatile compatablity-Headset works with Laptop, PC, MAC, PS4, smart phones and Newest version XBOX One provides a premium sound for gaming, music and voice chat with perfectly sound.Technical Specification: 1.Loudhailer diameter:40mm(NdFeB) 2.Frequency range: :20-20.000Hz 3.Sensitivity:113+/-3dB at 1kHz 4.Impedance:32 Ohm at 1khz 5.Max Input power:30mW (maximum) 6.Mic Dimension:6.0*5.0mm 7.Plug:3.5mm 8.Mic Sensitivity:-54dB +/- 3 dB 9.Magnet size:15.5 x 2.0mm 10.Cable length:Approx.2.2m 11.Distortion: smaller than 5% THD Package included: 1 x SADES gaming headset 1 x 2 to 1 adapter for ps4 controller Note: 1. When Connect to your old Xbox One controller, you need an extra Microsoft Adapter. This item don't include the adapter for xbox 360.2. 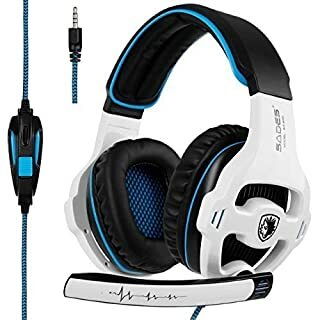 If the sound is too small or no sound: Ensure that your audio devices work properly and sound switch has been turned on ; turn up the sound volume level, Ensure connecting the plug of headset to audio source correctly.3. PS4 setting: Insert the headset own 3.5mm jack plug into the Gamepad, then long press the PS4 button or enter the system Settings, there is a peripheral machines, choose "Adjust Sound and Devices", "output to the headphones", then change it to "all audio ". SPECIFICATIONS: 1. Loudhailer diameter: 40mm(NdFeB) 2. Sound effect: 7.1 simulated sound channels 3. Frequency range: 20~20.000Hz 4. Sensitivity: 112dB +/- 3 dB at 1 khz 5. Impedance: 32 Ohm +/- 15% 6. Max Input power: 30mW 7. Mic Dimension: 6.0*5.0mm 8. Mic Frequency Range: 50-10KHz 9. Mic Sensitivity: -38dB +/- 3 dB 10. Cable length: 2.2m 11. 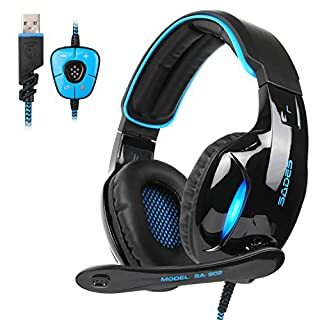 Input Plug: USB PACKAGE CONTENT: 1x SADES SA-902 7.1 Surround Stereo Headset With Microphone 1x SADES CD driver NOTE: Compatible with WINDOWS 10 , Drivers Ready to Download Compatible with Windows XP, Vista, 7, 8, 8.1 MAC Generic Use (No Drivers) Remind to adjust audio output of your PC/Mac to Headset/Headphones/Other Modes. 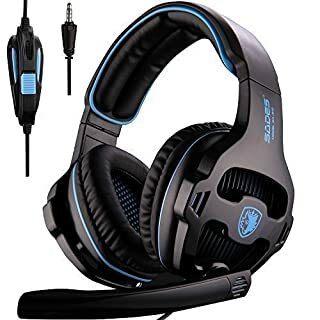 Why Choose SADES SA810 PS4 Xbox one Gaming Headset?Good ExperienceThis headset is compatible with PS4,2015 New Version Xbox One,PC, Mac,Notebook,Laptop ,Tablet. 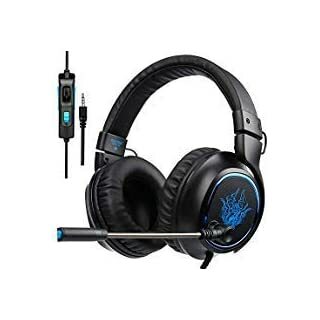 You will have a good experience High performanceEasy to set up and delivers high-quality, amplified digital game and chat audio through 40mm speakers without disturbing others.Technical Specification:1.Plug:3.5mm2.Cable length:Approx.2.2m3.Mic Dimension:6.0*5.0mm4.Magnet size:15.5 x 2.0mm5.Impedance:32 Ohm at 1khz6.Sensitivity:113+/-3dB at 1kHz7.Mic Sensitivity:-54dB +/- 3 dB8.Frequency range: :20-20.000Hz9.Distortion: smaller than 5% THD10.Loudhailer diameter:40mm(NdFeB) 11.Max Input power:30mW (maximum)Package List:1 x SADES SA-810 Gaming headset For PS4 new Xbox one1 x 3.5mm Headphone/Mic Splitter Cable For PCFriendly Tips1.please test it with your cellphone to ensure it function well before applying the headset on your PS42.you need extra Microsoft Adapter(Not including) when Connect to your old Xbox One controller. 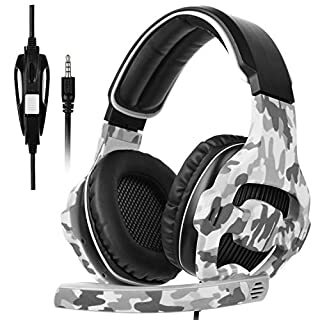 This item don't include the adapter for xbox 3603.PS4 setting: Insert the headset own 3.5mm jack plug into the Gamepad, then long press the PS4 button or enter the system Settings, there is a peripheral machines, choose "Adjust Sound and Devices", "output to the headphones", then change it to "all audio ". 4. It will be highly appreciated if you could contact E-Happy service team before you left a negative feedback . 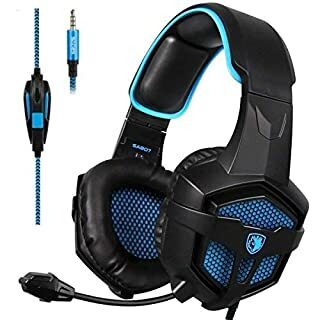 Specifications: Speaker: 40mm Impedance: 20Ohm±15% Sensitivity: 117dB±3dB Frequency: 20-20000Hz Headset interface: one 3.5mm 4-pins jack for stereo audio and mic 1* SADES New R5 Video Games Headset 1 * Instruction 1 * 1 to 2 splitter cable for PC Computers NOTES: 1. PS4 Setting: a. Before apply the headset on your PS4, please test it with your cellphone to ensure it function well. b. Insert the headset own 3.5mm jack plug into the Gamepad, then long press the PS button or enter the system Settings. c. There is a peripheral machines, choose "Adjust Sound and Devices", "output to the headphones", then change it to "all audio ". 2. You need extra Microsoft Adapter(Not including) when Connect to your old Xbox One controller.And this item doesn't include the adapter for xbox 360. 3.One year warranty for our headset. If there is any problem, please feel free to contact us. You great satisfaction is our goal. SPECIFICATIONS: 1.Loudhailer diameter: 40mm(NdFeB) 2.Sound effect: 7.1 simulated sound channels 3.Frequency range: 20~20.000Hz 4.Sensitivity: 112dB +/- 3 dB at 1 khz 5.Impedance: 32 Ohm +/- 15% 6.Max Input power: 30mW 7.Mic Dimension: 6.0*5.0mm 8.Mic Frequency Range: 50-10KHz 9.Mic Sensitivity: -38dB +/- 3 dB 10.Cable length: 2.2m 12.Input Plug: USB PACKAGE CONTENT: 1x SADES SA-902 7.1 Surround Stereo Headset With Microphone 1x SADES CD driver FEATURE: *Omnidirectional Microphone：Adjustable mic to reduce environmental noise so you can be heard clearly. You can adjust it up and down or move it completely out of your way for clearest voice pick up. 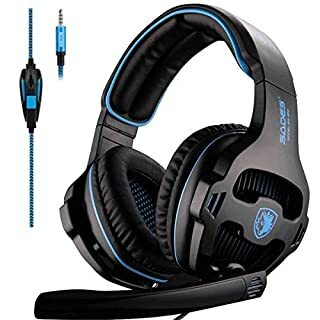 * Excellent sound quality：40mm HIFI capable driver with 20~20KHz frequency response, deep bass and urround sound NOTE: Compatible with WINDOWS 10 , Drivers Ready to Download Compatible with Windows XP, Vista, 7, 8, 8.1,10 MAC Generic Use (No Drivers) Remind to adjust audio output of your PC/Mac to Headset/Headphones/Other Modes.